The cream/rust stripe used in the sashing is from the Patisserie collection by Fig Tree Quilts for Moda. As you snuggle into the quilt, you’ll notice details that aren’t apparent at first glance. have a subtle touch of difference in print. This design is very Jelly Roll™ friendly, since all patches are cut from 2H”-wide strips. Planted Seed Designs offers a kit for this quilt which includes color-sorted precut 2H”-wide width of fabric strips. See Ordering Information at end of pattern. 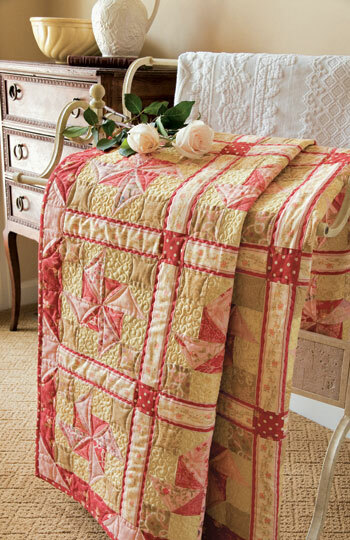 This Candy Apple Pinwheels Quilt Designed by Gerri Robinson, Machine Quilted by Rebecca Segura of Zeffie's Quilts.